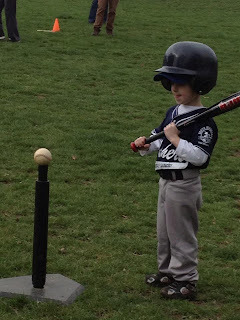 DADaPalooza: First T-ball game, if you can call it a game. First T-ball game, if you can call it a game. Our team is the WASHERS. We play the cleanest game in town! Nevertheless it was a fair amount of fun, and we'll be doing it again. My son is of course the most talented of a very talented lot. While doing drills, running the bases, or other things that are part of a team, having your mom or dad run with you or hold your hand is not cool. When the ball is hit, the base runner should run. On the base path, not towards the ball, towards the outfield, or in place. When you hit the ball, you run to first. Do not take your bat with you. When the ball is hit, the person who is nearest the ball should field the ball, not everybody converge on one spot and fight each other for the ball. You need to tag the base. With your feet. Positions in the outfield is pretty much useless in this game. There's the inner infield, the infield, and the outer infield. Players are positioned in rough semi-circles around the batter. Okay, when the batter hits the ball, you are going to run to third base. See that coach over there? (Waves) that's third base. When the batter hits it you run. 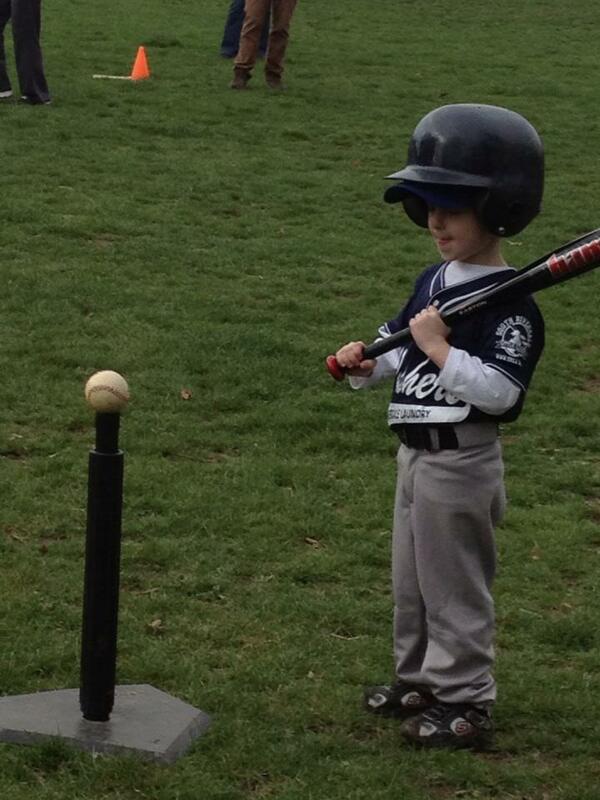 If he hits the T, or swings and misses, don't run! Now to get ready to run, put your foot like this, pointing towards third, and leave the other one on the base. Bend your knees. No, the other way around, so you can see the batter. Good. Hey First Base! You are running to me! We play Saturday Mornings next to the Spuyten Duyvil library, if you have the urge to cheer us on. You are allowed to bring coffee!